When we bought Shelby's Recaro seat, we thought she'd be in it until she was big enough to not need any kind of seat at all. It goes from 5 to 70 pounds after all, right? Well, kids get longer in addition to weighing more. She started incessantly kicking the seat in front of her. There was no stopping it (I totally understand ... I prefer the seat in front of me in the movie theatre ... back when we used to go places like that ... to be empty so I can put my feet on it). Then we went somewhere in a friend's car and she sat in a booster. Sold! So we got her one. She LOVES it. Victoria is furiously jealous. But on the way somewhere last week, she was laying sideways and looking at the ceiling. Mommy: "Sweetheart you need to sit up." Shelby: "I'm just looking at the ceiling. Of our car." Mommy: "The seat won't protect you like that though ... you could get hurt if you are sitting like that." Shelby: "Actually, it doesn't hurt." Actually? Where did she learn actually? She sounds like a teenager already. "Oh mom you are so dumb ... I'm doing it and it doesn't hurt. You're wrong." Mommy: "I meant if we get into an accident, you will be hurt. 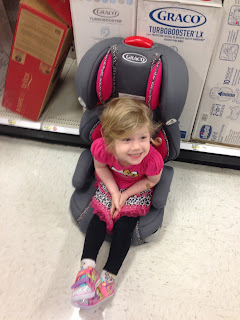 Sit in the seat the right way or we'll have to go back to the baby seat." Shelby: "I just want to look at the ceiling." Mommy: "You'll have to do it sitting up properly." Help! I think I might be raising a threenager. Or myself.